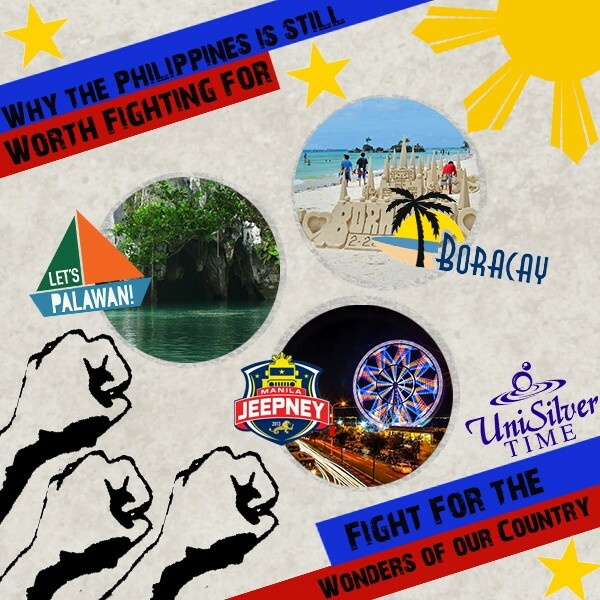 Top 10 Reasons the Philippines is Still Worth Fighting For! We recently commemorated the 31st anniversary of the EDSA Revolution last February 25, 2017. The EDSA Revolution is a historical milestone as we have overthrown a tyrannical government in a peaceful manner. Had it been a violent revolution - which I dare not wish for - I am confident to believe that Filipinos would still have struggled for their freedom with no less zeal than with what had transpired. Therefore it is safe and only proper to say, even if metaphorically, that Filipinos "fought for" freedom and democracy during that fateful event. #10: For Those who Fought for It! Our country has a very rich history dating as far back as it prehistory up to the time we have been colonized by the Spaniards and Americans, occupied by the Japanese, and underwent Martial Law. 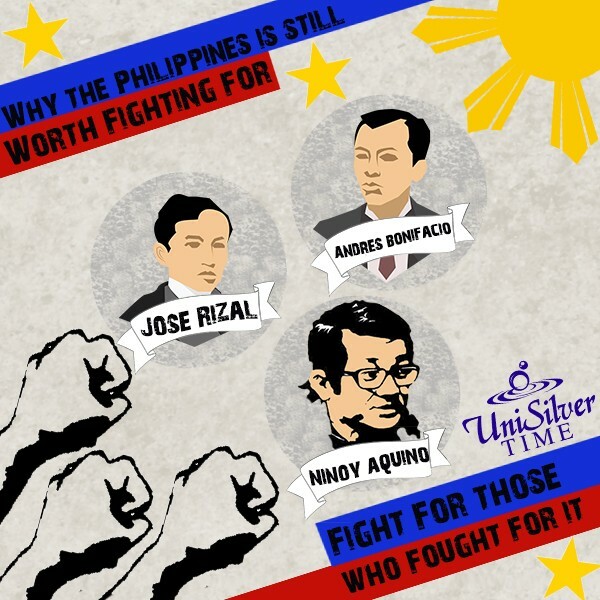 From time to time, whether in small or major battles, Filipinos find ways to fight for our independence and freedom. Heroes rise during these dark ages to shed light. That they had literally fought for our country (and shed blood in the process) should be enough reason to defend it or fight for it if invaders ever disturb us. #9: The Wonders of our Country! Have you been to the beautiful beaches of Boracay? Have you explored the wonders of the underground river of Palawan? Or have you even been around Metro Manila to experience its rich and diverse cultural heritage and its exciting nightlife? The 7,641 islands (to date) of this archipelago has a lot to offer. You'll be amazed by the beauty of our country, and I'm sure once you see and experience it, you'll be dying to fight for it. Name one Filipino who does not love Halo-halo, I dare you! We Filipinos love this creamy dessert (or merienda). 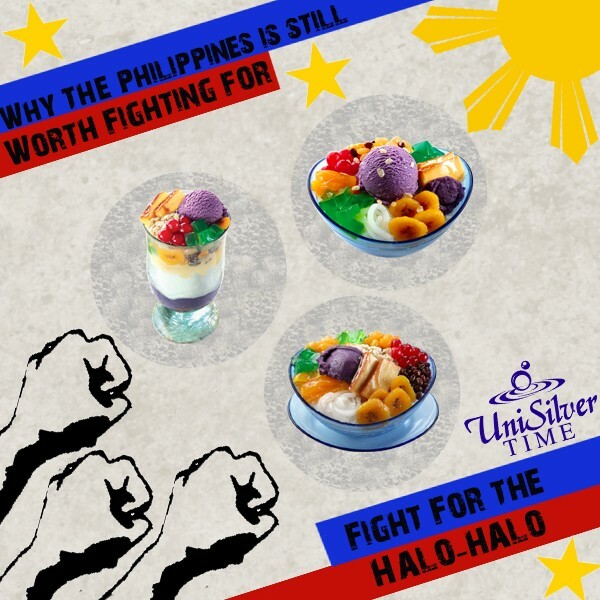 Halo-halo is perfect metaphor for our country. A nice mixture of different ingredients all mixed to serve one hell of a dessert. Just like our country, our diversity should be our strength rather than our weakness. So enjoy this tasty merienda and be one proud Pinoy! Filipino talents are starting to be noticed worldwide and it's time we start appreciating them here on our own land. 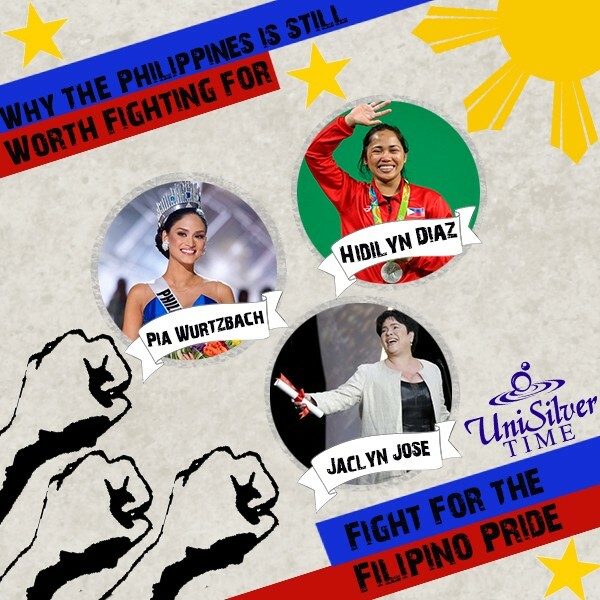 From the beauty and smarts of Ms. Universe 2015 Pia Wurtzbach, to the athleticism of Gilas Pilipinas (men's national basketball team) and silver-medalist Olympian Hidilyn Diaz, and to the award-winning talents of Filipinos in cinema, music and fashion. These are just few of the examples of how talented Filipinos are. There are a lot more to be discovered. If you don't believe me, try going to different barangay fiestas for their singing contests and you'll find a lot of Filipinos who could give Beyonce and Adele a run for their money! We Filipinos have been through a lot of different tragedies. Typhoons, earthquakes and other natural or man-made disasters tried to break us down, and yet amidst all of these, we still find a reason to put a smile on our face. This shows how resilient and persevering we are. After every tragedy we encounter, we always find ways to stand up. We have the heart of a fighter. So expect two things from us, Filipinos, after the world tries to put us down: one is that we'll always bounce back, and two, is that we'll always have a smile on our faces. Filipinos know how to party! Year-round fiestas are celebrated here in the Philippines. There are fiestas to celebrate rice, flowers, saints and almost everything you can imagine. Mind you, Philippine fiestas are one of the most colorful and exciting fiestas you'll ever experience, with its fun street dances and bright decors and parades. 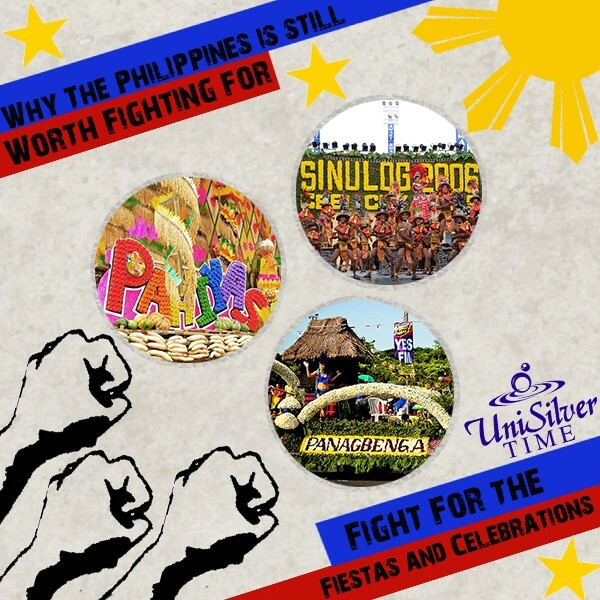 Some of the famous festivals are Pahiyas, Panagbenga and Sinulog. And this goes without saying how very hospitable Filipinos are: in fiestas, you get to be invited to different houses to dine with them - yes, even if you don't know anybody there - and saying "No" is a big no-no. Well, who would mind, for just the sight of Filipino cuisines are already mouth-watering! We really put the "art" in party and the "feast" in Fiestas! Lilo from the Disney animation "Lilo and Stitch" might as well be Filipino when she said "Ohana means family. 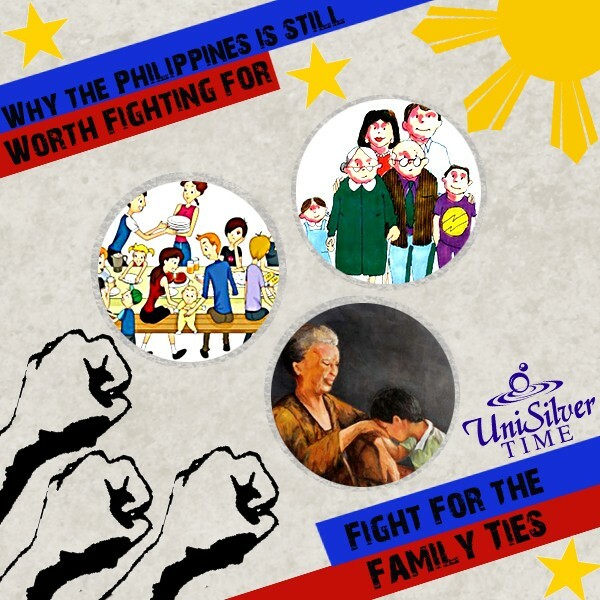 Family means nobody gets left behind..." Filipinos value family more than anything. We are there for each other through thick and thin. We are known worldwide for our strong family ties. We have immense compassion for each member of our family. We are all part of one huge family, the Philippines -our "mother" - and if Lilo is right, we shouldn't leave our country behind. Have you seen the Spoliarium painting or read the novel Noli Me Tangere? Have you watched the film "Die Beautiful" or visited the Pinto Art Museum? Filipinos have always been creative, then and now. We put our heart and soul in the things we do. These arts awed both locals and foreigners. And right now we are having a renaissance as more and more Filipinos are starting to enjoy and take pride on these creative expression. Clearly we give arts all our hearts! #2: For the New Heroes! Heroes are not just those who have sacrificed their lives for the country. Sometimes they are those who live for it. 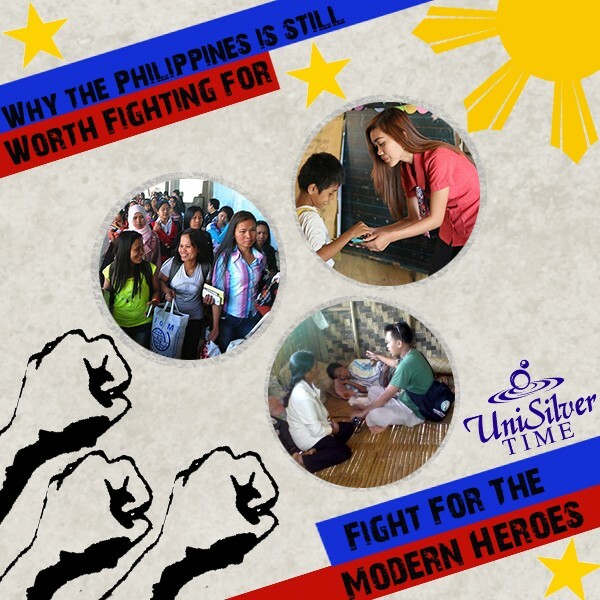 The Philippines are abundant with modern heroes including the following: the OFWs (overseas foreign workers) who left the comfort of the country to work abroad for their families, the teachers who are passionate to educate the youth notwithstanding the low salaries and low resources to do it properly, and the nurses and doctors in the barrios who would cross mountains to help save lives. Even those who do simple things for the betterment of our country such as the MMDA (Metro Manila District Authority) clean up personnels who toil to keep our street and sidewalks clean are also modern heroes. They have sacrificed a lot for our country and it's just a waste if we would give up on it. 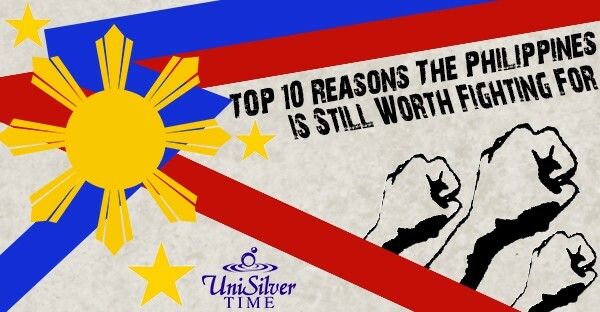 #1: Because We Are Filipinos! Maybe this could be all the reason you need. We are Filipinos and the Philippines is our dear mother. Forgive me for saying this: no mother is perfect (sorry Mom) nor is anybody perfect for that matter, but she gave us everything we need and shaped us to be who we are right now. If you are a Filipino and still can't find anything to be proud of your own country then there is something wrong with you, not with the country. Technically, I know our country is not the best. There are still a lot of things that need improvement in different departments, but I would rather sink along with the ship trying to fix it than survive by abandoning it. One step to improve our country is by appreciating it. Don't just focus on the ugly stains but also on the good traits our country has. 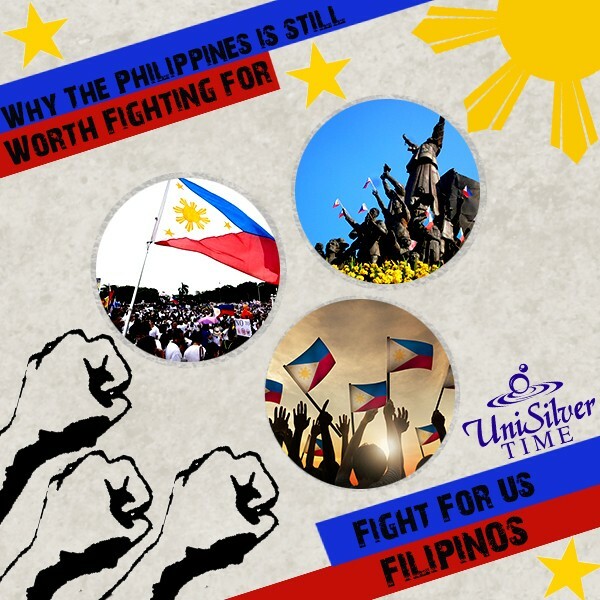 I am a Filipino and it's my time to be proud and fight for my country! I hope the top 10 reasons I gave you have opened your mind and heart to start giving more love and appreciation for the Philippines. You can show your love and appreciation even in your small simple ways. It doesn't have to be grand, like shedding your blood. Supporting locally made yet quality products is a good start. Being a good citizen by abiding the traffic laws and keeping the environment clean helps. Fashion is also a wonderful medium for expressing Philippine pride. 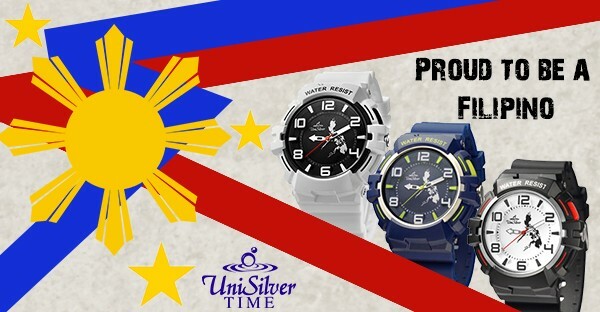 Here at UniSilver TIME we show our pride through our Makabayan Watches. 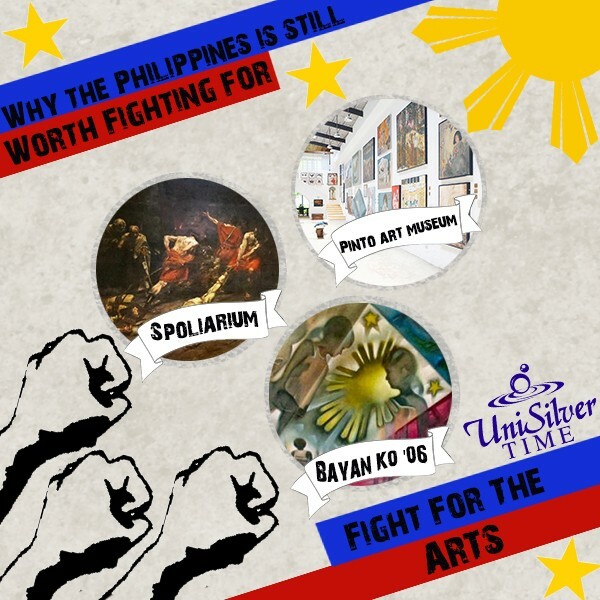 Do your part because the Philippines will always be worth fighting for!